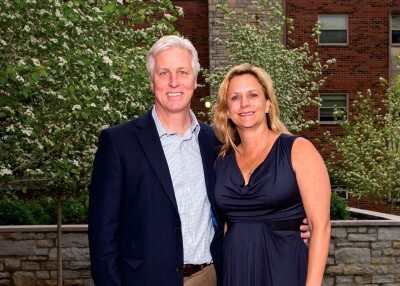 Ohio Wesleyan has been an important part of the Milligans’ lives since they met on campus more than three decades ago. They have remained connected to OWU in many ways through the years, notably as parents to Bradford F. Milligan ’15. John Milligan, Ph.D., majored in chemistry at Ohio Wesleyan, earned his doctorate in biochemistry from the University of Illinois, and served as an American Cancer Society postdoctoral fellow at the University of California at San Francisco. Until recently, he served as president and chief operating officer of Gilead Sciences, Inc., a Foster City, California-based biopharmaceutical company that discovers, develops, and commercializes therapeutics in areas of unmet medical need. The company’s mission is to “advance the care of patients suffering from life-threatening diseases worldwide.” Gilead has operations in North America, Europe, Asia, and Australia. Kathie Bradford Milligan majored in speech communications at Ohio Wesleyan, leading to a fascinating six-year career at the Federal Bureau of Investigations. She was a national spokesperson for the FBI at its headquarters in Washington, D.C., as well as at the FBI Academy in Quantico, Virginia. After leaving the FBI, she worked as a consultant for crisis and issue management and media relations for Fortune 500 companies. $5 million to create The John Fairbanks Milligan & Kathryn Bradford Milligan, Class of '83, OWU Connection Endowment to support the faculty-led curricular initiative that strives to connect academic theory with real-world practice; cross traditional academic department boundaries to support deeper, interconnected learning; and prepare students for meaningful global citizenship and leadership. Kevin is a proud member of the OWU Class of 1970 and Nancy has been a great friend to the University since being introduced to campus by John decades ago. The couple lives in Moreland Hills, Ohio. Kevin majored in economics at Ohio Wesleyan and earned his M.B.A. in finance from Cleveland State University. Today, Kevin is the Director of Thermon Group Holdings, Inc., a position he has held since 2012. He is a retired senior advisor of Peppertree Capital Management, Inc., a private equity fund management firm. Prior to founding Peppertree in January 2000, he served as a Managing Director of Primus Venture Partners from 1990 to December 1999. In both organizations, Kevin was involved in private equity investing, both as a principal and as a limited partner. From 1970 to 1990, he was employed by Society National Bank, now KeyBank, N.A., where in his final position he was an executive vice president. McGinty has over 40 years of experience in the banking and private equity industries, including 20 years as an officer of a bank and 20 years serving in the role of managing director for a variety of private equity firms. Nancy, is a community volunteer and entrepreneur who has been involved in fashion and jewelry sales. Nancy and Kevin have three children. A $500,000 commitment to create The McGinty Family Endowment for Economic Management Fellows, in recognition of Kevin McGinty’s longstanding service on the Alumni Advisory Board of the Woltemade Center for Economics, Business and Entrepreneurship, and The McGinty Family Endowment for Academic Support for Student Athletes, to fund initiatives that enhance the well-being, development, and OWU experience for Battling Bishop student-athletes. 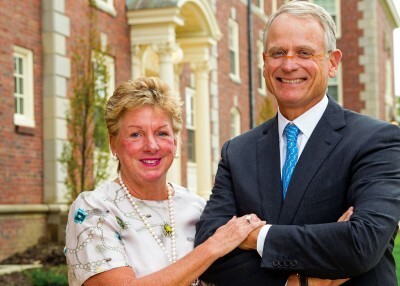 The couple’s contribution and match gift also benefit the Ohio Wesleyan Fund, an unrestricted account that supports campus operations; the President’s Circle, a group of alumni, parents, and friends who aid the president in implementing strategic initiatives; and the Woltemade Center, which oversees the Economic Management Fellows (EMF) program. Retired Senior Advisor, Peppertree Capital Management, Inc.
President & CEO, Gilead Sciences, Inc.
President & CEO, Marsh & McLennan Companies, Inc. Founder and Former CEO, Thermagon, Inc. Founder & CEO, Quantum Health, Inc.
Columbus, Ohio Chris Wolverton, Ph.D.